San Jacinto Title Services and our affiliated companies can assist with all aspects of land title, escrow, closing and real property research services. Since opening our first office in Corpus Christi in 1955, San Jacinto Title has been a trusted leader in title insurance and escrow services in South Texas. San Jacinto Title is dedicated to placing our customers first while providing consistent, reliable and professional service on every transaction. Our commitment to this ethic is evident in our long term customer and underwriter relationships, as well as our participation in significant property transactions that continue to shape South Texas. From closing on a first home purchase to insuring large commercial transactions, San Jacinto Title has the staff, experience and technology to ensure your transaction is handled properly. 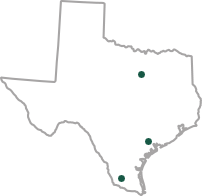 San Jacinto Title Services has 10 offices across South Texas and licensed title plants in the following counties.